Is your child tired of boring, old sandwiches? Why not skip the bread? Try puff pastry! Here's a recipe for a Ham & Cheese sandwich made with puff pastry. It will surely re-ignite your child's enthusiasm with this sandwich classic. 1. Cut each pastry sheet into four squares. 2. Fit 1 or 2 slices of ham on one side of each square. 3. Add the cheese on top of the ham. 4. Smear some mayo on the other side of the square. 5. Brush some egg on the edges. 6. Fold over the pastry. Pinch the edges together to make a seal. Tip: Use a fork to pinch the edges. 7. Brush some egg on top of the sandwich. 8. Place on a baking sheet lined with parchment paper. 9. Bake at 400 degrees for 15 minutes. Now all you've got to do is let them cool and pack them away in reusable containers for school lunches. An epic waste-free lunch idea. Your kids are going to love this lunch. A new twist on an old favourite. 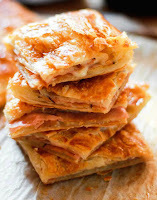 By the way, you could use puff pastry to re-invent lots of lunches sandwiches. Try chicken and pesto. Or pizza. Try turkey with veggies. Or maybe a breakfast sandwich with egg, cheese and bacon. The possibilities are endless!